The heads of 11 global health and development organisations make a commitment to find new ways of working together to accelerate progress towards achieving glocal health goals. Berlin, 16 October 2018 - Eleven heads of the world's leading health and development organizations today signed a landmark commitment to find new ways of working together to accelerate progress towards achieving the United Nations' Sustainable Development Goals. "Healthy people are essential for sustainable development – to ending poverty, promoting peaceful and inclusive societies and protecting the environment. 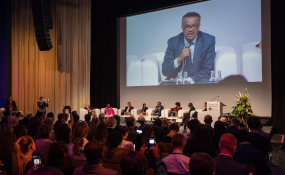 However, despite great strides made against many of the leading causes of death and disease, we must redouble our efforts or we will not reach several of the health-related targets," the organizations announced today at the World Health Summit in Berlin. "The Global Action Plan represents an historic commitment to new ways of working together to accelerate progress towards meeting the 2030 goals. We are committed to redefine how our organizations work together to deliver more effective and efficient support to countries and to achieve better health and well-being for all people." The group has agreed to develop new ways of working together to maximize resources and measure progress in a more transparent and engaging way. The first phase of the plan's development is organized under three strategic approaches: align, accelerate and account. Accelerate: They have agreed to develop common approaches and coordinate action in areas of work that have the potential to increase the pace of progress in global health. The initial set of seven "accelerators" include community and civil society engagement, research and development, data and sustainable financing.